Preheat oven to 350 °F. 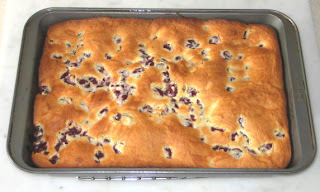 With a pastry brush or paper towel butter bottom and sides of 9” X 12” cake pan or spray with Baking spray (my option). 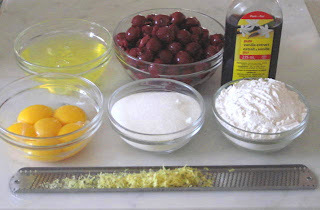 In a large stainless steel bowl beat egg yolks lightly with fork then mix in lemon zest, lemon juice and vanilla extract. Set aside. With electric beater or wire whisk beat the egg whites with a pinch of salt until they foam, then beat in the sugar, a tablespoon at a time. 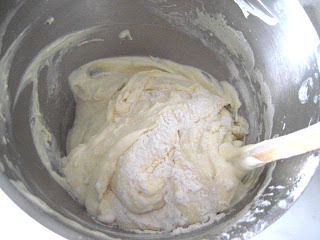 Continue beating until the whites form stiff unwavering peaks when beater is lifted from bowl. Do not overbeat. Note: It is important to have a super clean bowl for whipping egg whites. 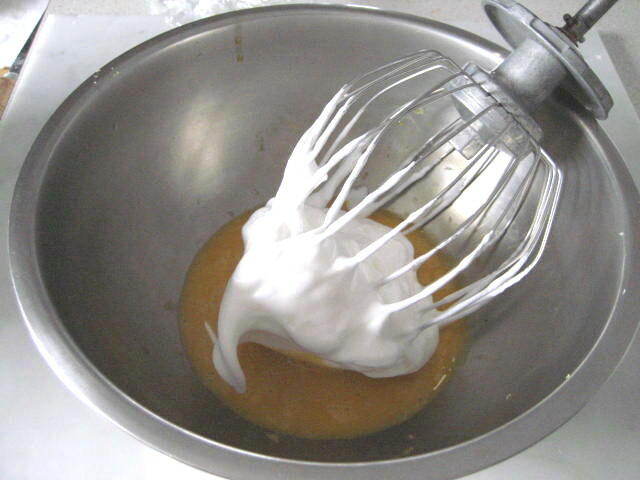 Smallest trace of fat or grease will ruin your meringue. Mix about 1/4 of the beaten egg whites into egg yolk mixture then reverse the process and mix with remaining egg whites. Sprinkle flour on top and with spatula fold until no traces of the flour and whites remain. 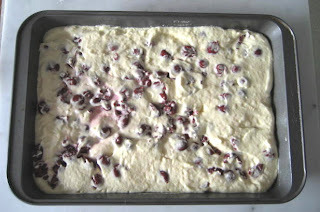 Pour the batter into pan and spread cherries evenly on top. 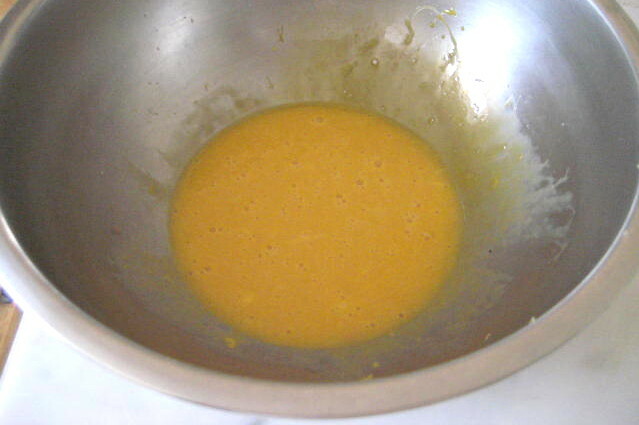 Smooth the top and place on middle of the preheated oven for about 40 minutes or until cake is nice golden brown and springy to the touch. 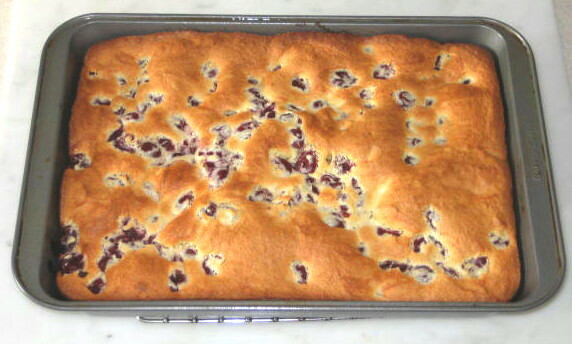 Cool in pan before serving. It is indeed a very delicious desert! 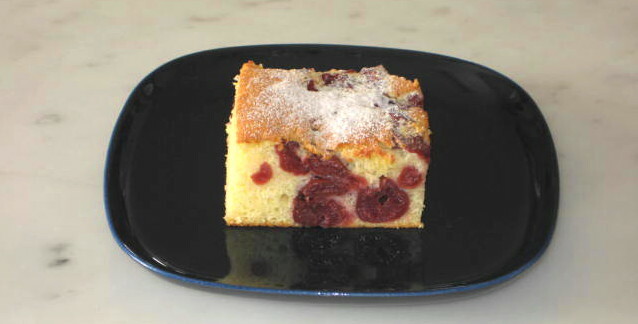 The cake is extremely light and flavorful. The cherries add a smooth texture to the cake. 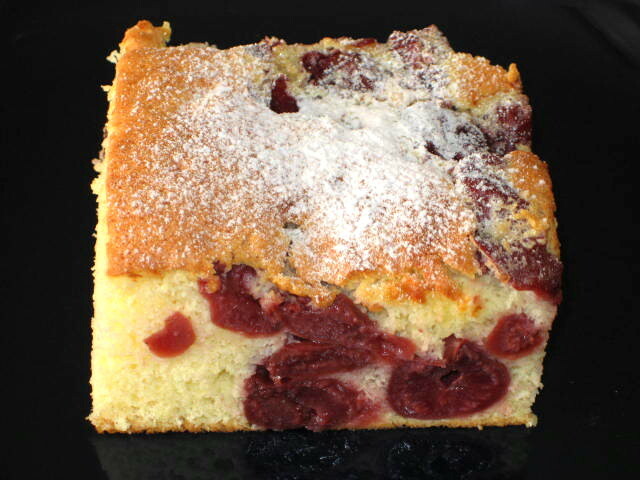 Most enjoyable when accompanied with a cup of tea or a good coffee. This desert is as good in winter as it is in summer. Certainly a favorite in our house. Can you taste it now? Virginie, your comment means so much to me because you are the expert! Merci beaucoup!